Grace Omega Stevens McCrary. Photo given to this researcher by Joanne Stevens Dalton. 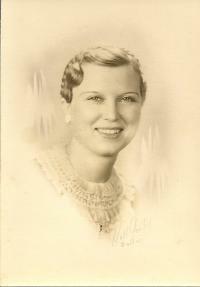 Grace Omega Stevens, daughter of William Archie Stevens and Anna Bell Travis, was born on 27 June 1907 at Bay Springs, Jasper County, Mississippi. Grace Omega Stevens was the daughter of William Archie Stevens and Anna Bell Travis. [S2] 1910 United States Census, population schedule, Bay Springs, Jasper County, Mississippi. Enumeration District 18, Sheet 1, line 16. Listed as a Retail merchant, groceries. ; digital image by subscription, The Generations Network (http://www.ancestry.com); from the National Archives microfilm. A printed copy is in the personal records of this researcher. [S3] 1920 United States Census, population schedule, Jasper County, Mississippi. Enumeration District 18, sheet 5, line 81.; digital image by subscription, The Generations Network (http://www.ancestry.com); from the National Archives microfilm. A printed copy is in the personal records of this researcher. [S120] 1930 United States Census, population schedule, Bay Springs, Jasper County, Mississippi, sheet 4A,k family 82, listed as a retail merchant (meat market). ; digital image by subscription, The Generations Network (http://www.ancestry.com); from the National Archives microfilm. A printed copy is in the personal records of this researcher. [S480] 1940 United States Census, population schedule, Bay Springs, Jasper County, Mississippi, Supervisor's District 5, Enumerator District 31-8, stamped page 116, Line 33.; digital image by subscription, The Generations Network (http://www.ancestry.com); from the National Archives microfilm. A printed copy is in the personal records of this researcher.